1 Point Sling VS 2 Point Sling. Which One Is Better? AR 15 Sling Buying Guide / Read Before You Purchase! 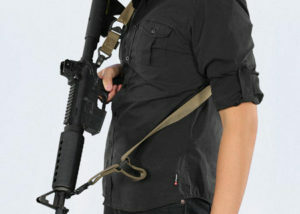 A rifle sling is one of the most important accessories you can buy for your AR 15. Not only will the sling help you carry your rifle like an AR15 case, but it can also improve your accuracy. But did you know that a good rifle sling can be a lifesaver in an emergency situation? In the following article, we present the best AR-15 rifle sling models of 2019 and reveal their pros and cons. Further, in the article, we explain the difference between different types of rifle slings, and how to find the right model. Length : Adjustable from 30"- 56"
Length : Adjustable from 45"- 58"
Whether you’re going on a hunting trip, or you’re simply looking for an easier way to carry your AR 15 on your way to the range, you should consider buying a rifle sling. 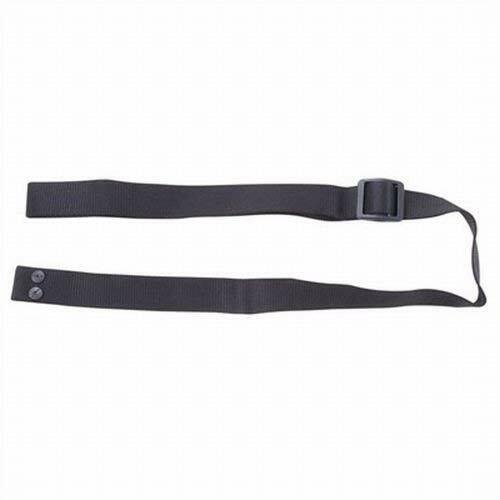 This rifle sling produced by Tactical Hero is adjustable, and you can lock it in place anywhere between 30” – 56”. Whether you’re tall or short, this sling will fit. The sling is made out of nylon, and it’s 1.2” wide. It comes with an adjustable shoulder pad that will make carrying your rifle even easier. 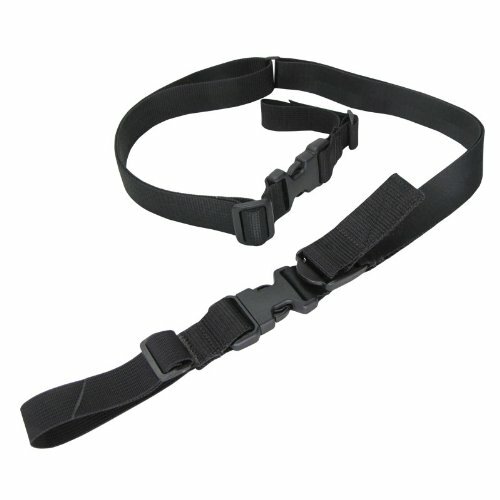 The sling comes with both HK clips and straps, so it will connect to your rifle without any problem. 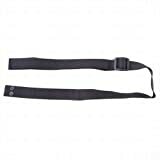 Solid Attach Points – This rifle sling comes with solid attach points, so you don’t have to worry about it breaking when you fire your rifle. The manufacturer also includes protecting covers for the clips, so they won’t rattle. Not Easy To Adjust – Sometimes the sling doesn’t adjust very easily. This might be a problem in the field. 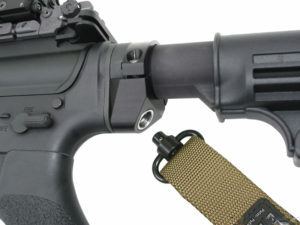 If you’re looking for an inexpensive 2 point sling for your AR 15, you should take a closer look to the model produced by Outdoor Connection. 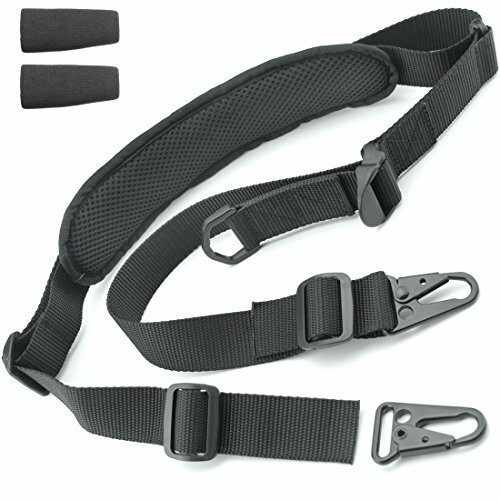 This sling is 1.25” wide, and it comes with an easy to adjust tri-glide system. 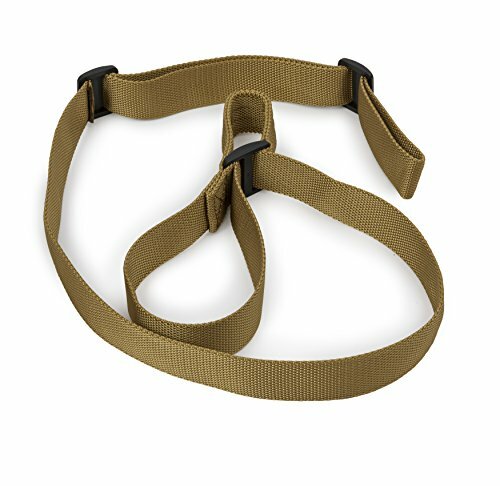 This heavy-duty sling has a mil-spec type webbing, and it’s easy to attach to your rifle. The sling comes in black, and it will look good on an AR 15. This model is very easy to adjust, and it’s long enough for most people. Simple Design – This sling has a very simple design, but it does exactly what it’s supposed to. The sling will help you carry your rifle and brace when you fire. What more could you ask from a sling? Not Short – Even though some customers complained that the sling is too short, that’s not true. The sling appears short once you open the box, but you can adjust its length easily. 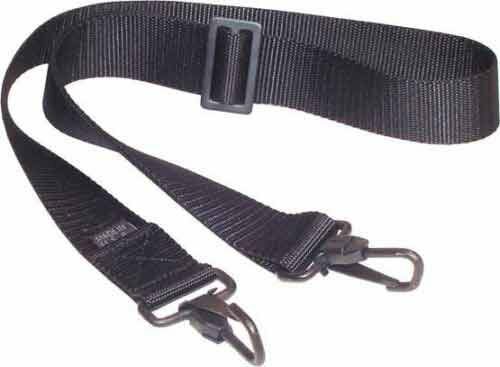 Webbing Might Be Uncomfortable – Some customers complained that this sling’s webbing might be uncomfortable if it comes in direct contact with your skin. However, this might be true for all slings. If you’ve used a sling for your rifle before, you know that being able to adjust it quickly on the go is very important. Sometimes when you shoot, you want to brace in the sling. Other times, you feel like the sling is in your way, and you can’t adjust its length fast enough. Well, if you’re one of the shooters who always like to tweak their gear, you’re going to love the STI rifle sling. This sling is made out of a heavy-duty nylon, and it has a design that protects it from tangling and chafing. The sling is 1.25” wide, and it can connect to all types of hardware. Easy To Adjust – This sling is very easy to adjust, and you can make any modifications necessary on the go. You can extend the length when you’re firing, and collapse it when you’re carrying the rifle. Strong – This sling is very strong, so once you buy it, you can expect to use it for a very long time without noticing any signs of wear. Instructions Could Be Better – The sling comes with an instructions manual that explains how to install it on your rifle. The manual also shows a link you can access to watch an instructive video. The written instructions and the video can be contradictory at times. Whether you want to buy a sling to help you shoot, or you just want one to help you carry your AR, finding a high-quality one is important. The Speedy rifle sling produced by Condor is a good model that comes at a decent price. This sling fits well and it comes with sturdy quick release clips. The sling is easy to adjust, but it maintains its length once you set it. The length of the sling can be adjusted between 35” and 65”. Sturdy – This sling is sturdy, and its stitching is well-made. The loop end and the two squeeze buckle releases are well designed. Once you start using it, this sling can last for many years. Long – The sling is long when it’s extended at its maximum capacity. The length of the sling will allow tall and heavyset people to use it without experiencing any problems. Not Very Comfortable – This sling might not seem very comfortable, especially for short and slim people. The length of the sling might be too much for some, allowing their rifles to bounce. If you’re looking for a good 2 point sling, but you’re on a strict budget and you don’t want to spend too much money on one, the FreForce sling is the model you’re looking for. This sling comes in four different colors, so you can be sure you’ll find one that matches the finish on your AR 15. The sling is 1.5” wide, and it has a maximum length of 54 inches. The sling is easy to adjust, and all the stitching it has looks great. The attachment clips and the adjustments slide come in a similar finish to the color you choose. Good Looking Colors – This sling comes in great colors, no matter which one you choose. The colors are really close to the ones used for AR 15 finishes, and all the clips and slides are similarly colored. 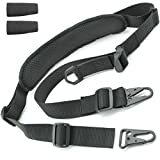 Cheap – Even though this is a very good rifle sling, it comes at only a fraction of the price of other models. Adjustment Could Be Smoother – Even though the sling is not difficult to adjust, the adjustment could be smoother. If you’re moving, adjusting the sling can take up to one minute. If you’re looking for an AR 15 sling, you might have noticed that some models are 1 point slings, and others are 2 point ones. You might be wondering what the difference is between them, and which one is better. Well, a one point sling connects to your rifle in a single point. A two-point sling connects to the rifle in two separate points. Which one is better, you ask? Well, it’s mainly a matter of preference, but here are their pros and cons. As you can see, both models have advantages and disadvantages, but the two-point sling is better than the one point because it doesn’t interfere with your movement, and it allows you to use both your hands at the same time. Using a rifle sling offers many advantages, probably more than you might think. The AR 15 is not a light rifle, and it can be uncomfortable to carry in your arms for a very long time with an AR-15 scope. Carrying the rifle in your arms might even decrease your accuracy if your muscles are tired when you take aim. A sling will distribute the weight of the rifle across your shoulder or back, making it easier to carry. If your primary weapon has a sling attached, you will be able to transition quickly between it and your sidearm. This can be a tremendous advantage in the field. Wearing the primary weapon over your dominant shoulder will allow you to draw your sidearm quickly without any interference. Wearing the sling over the weak-side shoulder might place the rifle straight over the sidearm, making it slightly more difficult to reach. Rifle slings can be very effective when you know how to use them. Some shooting stances, such as the prone or the sitting shooting stances, are easier to hold when using a sling. After you position yourself in a shooting stance, tighten the sling until it takes some of the rifle’s weight from your arms and it distributes it across your back. This will allow you to hold the shooting stance for a longer time. Rifle slings are made out of durable nylon or paracord. Both of these materials are versatile, and they can be of great help in an emergency situation. The straps can be used as a tourniquet, but they can also be used to make snares, traps, and even to build a shelter. Believe it or not, padding can be very important. If you’re one of the people who drive at the local range, takes out the rifle, shoots some rounds, gets back in the car and drives home, a padded sling won’t make much difference. However, if you like hunting, and you spend a lot of time tracking game, padding can be really helpful. No matter how fit you are, an AR 15 is not a rifle you would like to carry in your arms for a long time. If you buy a sling, you can just hang it over your shoulder and let your back do most of the carrying. But if you really like hunting, you might decide to go on a hunting trip in the middle of the summer when the temperatures are high. If you go in any other season, you can wear a vest or a jacket that can protect your skin from chaffing. But if you go during the warm months of summer, a vest or a jacket might be an even bigger inconvenience than the potential chaffing. This is the kind of situation when padding can be really helpful. The pad is wider than the sling’s strap, so it will also help distribute the gun’s weight on a larger surface. The distributed weight will relieve some of the pressure felt by your shoulders. Well, it’s easy to understand why a rifle sling should be durable. When you’re shooting your rifle, the sling will take on some of the recoils, so it has to be able to withstand it. But how can you determine which sling is more durable than another? They all look similar and work in the same way, after all. Well, the devil is in the details, as the saying goes. One of the best ways to determine a sling’s durability is to check out its attachment clips and adjustment straps. If they are plastic, they might not perform very well. Of course, some of them might be made out of hardened plastic, which is more durable than the normal one, but you have to make sure the manufacturer specifies this. A better solution is finding a sling model that comes with metal clips and adjustment straps. Metal is more durable than plastic, so a sling with metal clips should last more than one with plastic ones. Another way to determine which model is more durable is to look after the Mil-Spec criteria. If manufacturers produce a sling that fulfills the specifications required by the Military, you can rest assured they will advertise this fact. Length is one of the most important features of a rifle sling. If the sling is too long, you won’t be able to adjust it properly, and the rifle will wobble at your side. If the sling is too short, you won’t be able to fit it properly around your shoulders, and it will make the transition between the resting and firing positions difficult. If you want to make sure the rifle sling you’re buying has the necessary length to fit you, you can take a measuring tape and measure the width of your torso. Depending on how you’re planning on wearing the sling, and the type of sling you’re thinking of buying, you can either measure the width of your back cross-shoulder or over a single shoulder. It’s always better to buy a longer sling than a shorter one. Longer slings can be adjusted by either using the straps or if that still doesn’t make the sling fit, by cutting it with scissors. You should be warned though, rifle slings are pretty durable, and you might have a hard time cutting them. You should also know that once you cut the sling, you might have a difficult time fitting it back into the attachment clips. When it comes to the sling’s length, the best solution is still finding a model that can fit you properly, to begin with. People wear rifle slings as they’re used to, or as they find it comfortable. Here are some popular ways of wearing a rifle sling. One Point Slings – People who prefer one point slings usually wear them over one shoulder, or diagonally across their chest. If you intend to walk while wearing the single point sling, we recommend you wear the sling over a single shoulder. The cross-shoulder carry is more comfortable while standing, but the point of the weapon will dangle between your thighs or knees. If you wear a long sling, the rifle might accidentally hit you between the legs, and nobody wants that. Two Point Slings – Two point slings can be worn either on one shoulder or cross-shoulder. The side use is a popular way of wearing the rifle, and it allows you to reach both your primary and your sidearm fast. 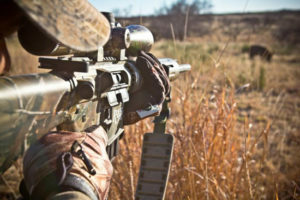 If you carry your rifle wearing the sling over your weak-side shoulder, you can transition from resting to the low-ready position in an instant. This can be an advantage, but it might also interfere with your ability to reach your sidearm. As Shooting&Safety editors we’re certain that after reading our short rifle sling reviews and the comprehensive buying guide, you are now capable of making an informed decision when buying for one. Keep in mind that the best AR-15slings are not always the most expensive ones. After you buy a rifle sling, make sure you practice a little before using it. Try fitting the sling over your dominant and weak-side to determine which works better for you. You can also try bracing in the sling while you’re firing at the range. Using the sling can help you improve your accuracy.